r they realy stronger than hayes/avid mech?? 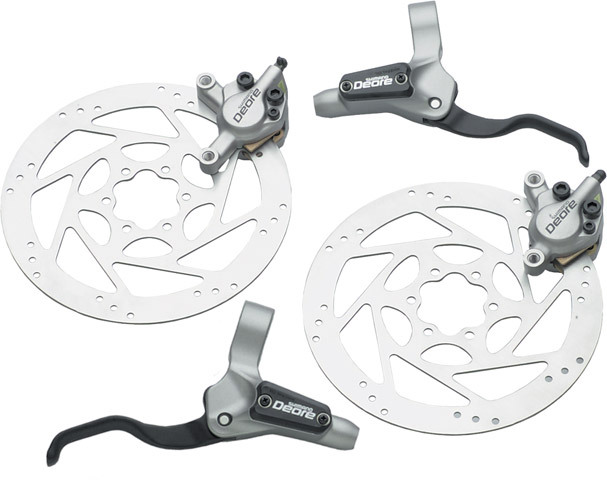 Give me any comment that u think will help me in to choice of a "strong" and cheap disk brake set. get what you pay for, and have you checked the reviews over in the review section? If you use rule of thumb for best combo of performance, value and service, that's the one for you. For example, if the brake is the most powerful but you can't get pads locally, or service for parts you might need, then it's no good for YOU. I've a set of 525's and they are noisy on my bike, they might not be on yours. Changing the rotors helped me. They work just fine thanks. I hear the pads wear quickly but I've not gotten there yet. Lastly, you give us no idea of the type of riding you do, making any kind of comment on that aspect impossible. Which rotors did you switch to? Ive got the same brakes M525 with the same noise issue. Will the Shimano RT-75's work? The M555 work great. I would like to get another set but I can't find any more.